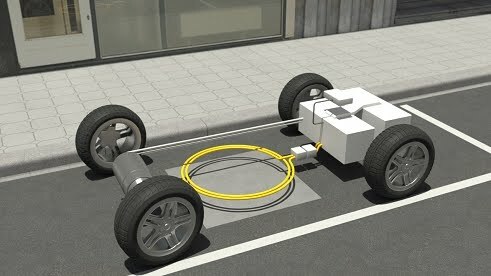 To test feasibility of a inductive charging system, Daimler and Conductix-Wampfler have elaborated the basics for wireless charging of electric vehicles in a research project cofunded by the Federal Ministry for the Environment, Nature Conservation and Nuclear Safety (Bundesministerium für Umwelt, Naturschutz und Reaktorsicherheit, BMU). Main target of the project “wireless charging” is a safe, automotive grade charging system with maximum efficiency and minimum weight and package. Goal of the field test is to evaluate everyday usability of wireless charging as well as to probe advantages and disadvantages in comparison with charging by plug and cable. As early as a few days into the field test the advantages customer comfort and charging safety by the automated charging process became apparent. The testing is focused on the basic charging process. Efficiency of the system admittedly still doesn´t match charging by cable, but is with 90 percent already very promising and only slightly beneath cable based solutions, if all components from socket to battery are taken into account. There was an evaluation of the first “driving-experiences” with study participants who had to “drive onto the optimum charging position”. After two or three exercise runs this could be well achieved supported by parking assistance functions. The system tolerates smaller deviations within the range of a few centimeters without noteworthy loss of charging efficiency or transferable power. Also, the system showed already good results regarding electro magnetic compatibility. It is the task of future engineering work to optimize this as well as to improve efficiency and to develop solutions for a series application. The protototypes built within the project on the basis of the B-Class E-CELL with range extender are equipped with an electronic rectifier and a collector coil integrated into the underbody cover. Main components on the infrastructure side are the supplying electronic and the charging coil, which was realized in two variants – as an above ground and beneath ground coil. Besides the wireless energy transfer other functional aspects are the wireless communication between infrastructure and car, the driver assistance function “driving onto the position above the charging coil”, the automatic start of the charging process and the vehicle identification. In the area between the coils an object detection avoids risks by warmed metal items. Detailed scientific studies generated the foundation for the first layout of the inductive transfer components with automotive specific requirements and their optimization regarding package and weight. Comprehensive system simulations served to validate the designs. Conductix-Wampfler has developed all components of the system and could rely during the process on comprehensive experience with inductice power transfer in manufacturing automation as well as on know-how from the wireless charging of electric busses in Genoa and Turin. These are in operation since 2003. Daimler has defined the functions of the charging system on the car´s side and realized the assistance system for driver support. The system was integrated into two vehicles with range extender, nameplate Mercedes-Benz B-Class E-CELL Plus. The coil integration within the underbody cover of the cars was designed and supplied by Röchling Automotive. After the prototype vehicles had been built the complete system was mechanically and electrically integrated and taken into operation as a whole. Two inductive charging stations are in the field at the Daimler-Engineering-Location Böblingen-Hulb and are intensively used for the everyday-tests. First conclusions confirm the considerable gain of comfort in comparison with cable based charging and that inductive charging is suitable in principle. The potential optimization regarding package, weight and integration in future vehicle model lines is identified and will accordingly be further developed. At the same time an evaluation is done on new common projects with potential inductive charging applications in small commercial vehicles and busses. The results of the current tests are important to national and international standardization activities – with the aim to guarantee interoperability of inductive charging systems of different suppliers and vehicle manufacturers.